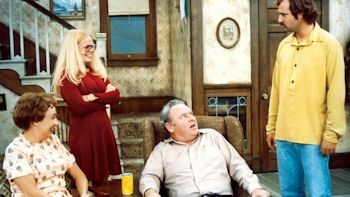 Sanford and Son, Good Times and All in the Family are leaving Antenna TV at the end of this month, but it looks like getTV have picked up the rights to those series come Jan. 1. All three series will start on Jan. 1 with a New Year's Day marathon from 6am-4am, with various blocks. All three series will join the schedule on Tuesday, Jan. 2. 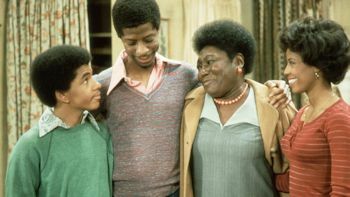 Good Times will air weekdays at 5:00pm & 5:30pm and again at 12:00am & 12:30am. 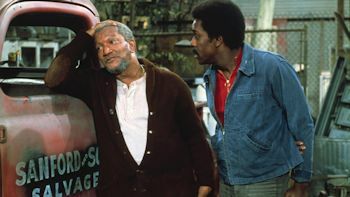 Sanford and Son will air weekdays at 6:00pm & 6:30pm and again at 11:00pm & 11:30pm. And All in the Family gets the 7:00pm & 7:30pm half-hours and again at 10pm & 10:30pm. Also being quietly added to getTV will be the Brad Garrett/Joely Fisher sitcom 'Til Death, airing weeknights at 1:00am & 1:30am. It looks like Designing Women will be off the regular schedule but the sitcom will get a marathon on Monday, Jan. 8 in the early hours of 12am-6am. Other series airing on getTV still are 7th Heaven, In the Heat of the Night, Airwolf and Ghost Whisperer. Also getting some play is the ABC '80s variety series Dolly starring Dolly Parton. Misery loves a company and that company is Hampton DeVille. From Pat Bishop, Matt Ingebretson, and Jake Weisman comes a dark, edgy workplace comedy unlike any other. Comedy Central's newest scripted series, Corporate, takes you inside Hampton Deville - your average, soulless multi-national corporation - and follows the miserable lives of two downtrodden employees. Corporate premieres Wednesday, January 17 at 10:00 p.m. ET/PT with back-to-back episodes, as well as special bonus content. Beginning today (Wednesday, Dec. 13), TV subscribers can stream the first four episodes of the series exclusively on cc.com and the Comedy Central App or watch via their preferred TV provider's video-on-demand (VOD) service. Corporate stars series' creators/writers/executive producers Matt Ingebretson and Jake Weisman as two Junior Executives-in-Training at Hampton DeVille, a heartless, corporate hell-hole led by tyrannical CEO Christian DeVille (Lance Reddick) and his top lieutenants, sycophants John and Kate (Adam Lustick and Anne Dudek). As Matt and Jake navigate an ever-revolving series of disasters their only ally is Grace (Aparna Nancherla), a Hampton DeVille Human Resources rep who is beleaguered by both her job and her exhausting relationship with the very needy Matt and Jake. Guest stars across the first season include Anna Akana, Jon Daly, Philip Baker Hall, Natasha Lyonne, Aimee Mann, Rory Scovel, Baron Vaughn, Kate Walsh and Fred Willard. In the premiere episode ("The Void") Matt and Jake are given their first bit of power as Junior Executives-in-Training when they are tasked with firing an employee who sent out an insensitive tweet from Hampton DeVille's Twitter account. With the internet outraged by the tweet and calling for a boycott of the company's latest product on the day of launch, the guys have to literally talk the fired employee off the ledge with the only thing a depressed corporate drone has to live for: a slice of birthday cake.